Choosing to celebrate your wedded bliss aboard Disney Cruise Line is both fun and romantic. Having sailed several times myself, I'd like to share a few pointers to help you make the most out of your vacation. Bring a small carry-on to hold any overnight clothes and toiletries you will need for your final night on the ship. Your larger luggage is conveniently picked up the night before disembarkation. Surprise your sweetie with a gift ordered in advance by calling (800) 601-8455, or by visiting the Planning Center. Every day of your cruise is a special occasion - order the "Cake of the Day" through room service! Lucky for you, room service is complimentary. Experience something new! There's no better time than your honeymoon to make new memories. 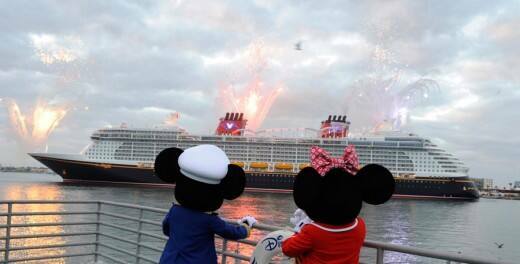 Disney Cruise Line vacations offer a wealth of opportunities to explore the unknown together. A honeymoon is all about relaxation. Unwind with the ultimate pampering provided by a couples massage. Let us know in the comments below if you have any tips for couples starting their happily-ever-after together aboard Disney Cruise Line!